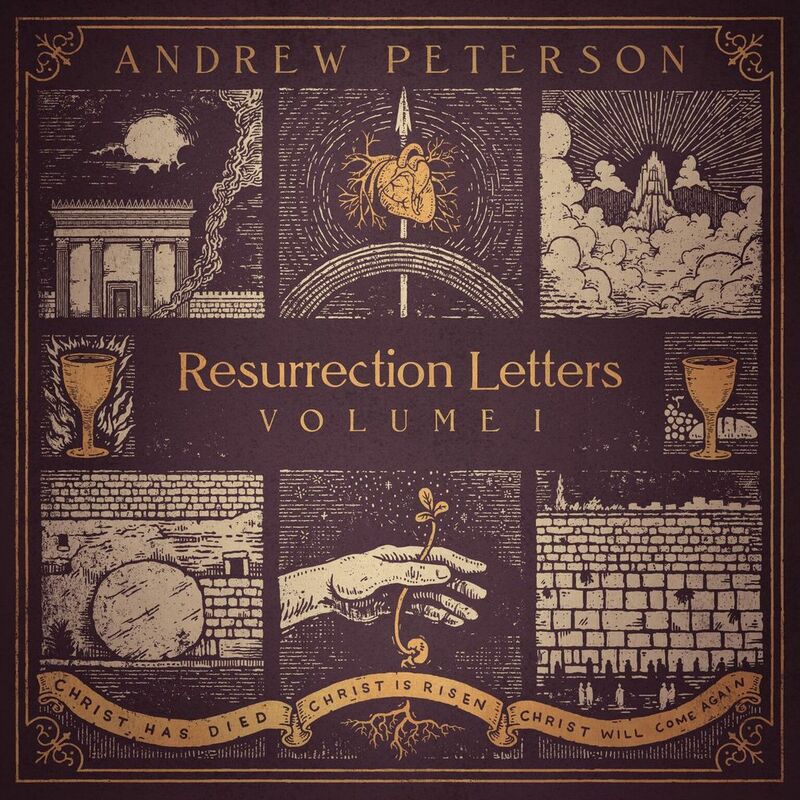 Andrew Peterson – Resurrection Letters, Volume 1: The last enemy to be destroyed is Death. In Brief: In celebrating the resurrection of Christ, which is the middle part of a three-part story he’s been working on since 2008, Andrew Peterson delivers an upbeat and triumphant set of songs, which can sometimes be rather middle-of-the-road and mildly corny, but I still appreciate the thematic resonance it has with the first (last?) entry in the trilogy. Andrew Peterson‘s Resurrection Letters Trilogy began with a sequel, and then it was 10 long years before it was finally followed up with a prequel. Now it’s ending with the middle of the story. Confused? The cover art for the final piece of the puzzle, the album Resurrection Letters, Volume 1, gives us a clue as to why he did things this way. There’s a banner at the bottom of the image that reads “Christ Has Died, Christ Is Risen, Christ Will Come Again.” Peterson’s 2008 album, Resurrection Letters, Volume 2, was the first batch of songs he wrote for the project, asking the question of “What do we do now?” after receiving the gift of salvation, while awaiting the second coming of Christ. His plans to eventually follow this up with the earlier part of the story – Christ’s death on the cross and resurrection – didn’t come to fruition until this year, and he decided to break out the “death” part of the story into its own separate chapter, which became excellent EP Resurrection Letters: Prologue. Finally, on Good Friday 2018, with Easter right around the corner, Volume 1 was released, and even though the custom with new albums these days is to release them on Friday, Peterson encouraged his fans to wait two days until Easter for maximum effect. We needed to sit with the somber mood of Prologue until that day of ritual celebration came around, and I obliged Peterson’s request by saving my first listen until I could squeeze in a little solitude on that Sunday afternoon, when I could take the album in with minimal distractions during a relaxing walk around the neighborhood. It was worth giving it my full attention, because while I hadn’t really listened to Volume 2 in its entirety for many years, the resemblance of many of these new songs to the style of that decade-old album gave it a nice sense of symmetry. Given how much the landscape of modern music tends to be littered with “part ones” of projects that never get followed up due to lack of interest from fans (or fat that matter, an artist who quickly moves on to other ideas), it’s incredibly satisfying to hear a planned multi-album arc actually reach its conclusion. Resurrection Letters, Volume 1 does that quite nicely, as its nine songs, most of which seem to touch on the thoughts and experiences of the Disciples in the wake of Christ’s return from the dead, do an incredible job of queuing up the story threads to right where we found them at the beginning of Volume 2. As with many of Peterson’s albums, there is a downside, and that mostly has to do with the music. Peterson’s chosen style, which merges mellow, piano-based pop music with occasionally rootsy folk music, tends to serve quiet contemplation better than it serves more surface listening with the intent of singing along to big hooks and joyful choruses. Due to the nature of this album, it certainly has a bit of the latter, but the hooks and the melodies overall still feel a bit restrained. At its best, this record is yet another example of how well Peterson has picked up the mantle from his musical hero Rich Mullins – he’s probably gone to that well more than any other CCM artist in recent memory, but he does it incredibly well, and when he brings out the hammer dulcimer or otherwise composes a modern liturgy in the style of some of Mullins’ best work, I can’t help but smile. It’s the stuff in between, that doesn’t aim to be quite so big and sweeping but that also doesn’t quite go for the delicate textures heard on the Prologue EP, that I’m kind of iffy about. At times there’s an uneasy balance between a personal, inspirational story that Peterson wants to tell, and a didactic moral that he wants to clearly sum up by the time he gets to the chorus. It’s either that, or a few of his attempts to shoehorn a crowd-pleasing sing-along into a song that doesn’t quite have the melodic heft to pull it off, that he comes across as a bit cheesy. There are only nine songs on this album – and since we have the Prologue to complement it, I’m fine with the shorter album length, but at least three of these songs strike me as either overly corny or just plain unmemorable, and that’s a good third of the album. There’s only really one track that I’d consider a stone-cold classic worthy of Peterson’s all-time best work – and considering that I found three such tracks on the five-track EP that precedes it, that makes the project a bit unbalanced. Still, if you enjoyed Volume 2 all those years ago, or are a fan of Peterson’s style on any of his past albums, you’ll probably find most of this album to be agreeable. It gets the job done, and on a calm Easter afternoon when I simply cared about focusing on my gratitude for a gift I could never earn more than I cared about listening for killer pop hooks, that’s exactly what this listener needed. This would be the song that I consider an instant “stone-cold classic”… and there’s an unintentional pun there now that I think about it, because the song is literally about the cold, lifeless body of Jesus returning to life again, breath filling his lungs and blood pumping through his veins. In deliberate contrast to the songs from Prologue, this one is a big, confident anthem of praise right out of the gate, essentially serving as a counterpart to Rich Mullins’ “Creed”, just in Peterson’s own words. What’s interest is how it gets from the verse to the big, inspiring chorus – I was actually taken aback at first by how deliberately monotone the verse melody seems at first, as if the notes themselves had been lying flat in the tomb and were now quite vividly coming back to life. Peterson’s grappling with the event at the very center of the Christian faith here, and one would be tempted to think there’s no new way to write a song about it at this point, but the way that he focuses on those physical biological processes at first before turning a corner into the more declarative, spiritual language of the chorus puts a genuinely unique spin on it. It’s hard to express timeless tenets of the faith and curiosity in the same breath, but Peterson accomplishes this with clever turns of phrase like “He took one breath and put death to death” and “O grave, how grave is your defeat?” While Peterson’s use of the hammer dulcimer is bordering on cliche at this point due to how much of his career he has spent trying to carry the torch for Mullins, the inclusion of electric guitar here also reminds me of Peterson’s own song “The Cornerstone” from Light for the Lost Boy, just not quite as lagged around the edges. The overall mood is also quite reminiscent of “Hosanna”, which was the analogous “big Jesus anthem” on Volume 2. And I really enjoy the way he interpolates little snippets from the hymn “Crown Him with Many Crowns” here. This is clearly a subject that Peterson loves coming back to again and again from different angles, and instead of it feeling repetitive, I can tell that he’s still getting quite a bit out of it after all this time. The second tracks backs off a bit on the energy level (as does most of the album), though it’s still got a sprightly pace to it, driven mostly by a pretty, sunshine-y piano melody as Peterson describes the experience of the disciples upon first encountering the risen Christ. Their renewed hope is like the first rays of sun thawing the frozen ground after a long, brutal winter. Peterson is of course playing off of the old “He is risen”/”He is risen indeed” exchange that so many of us are familiar with from Easter Sunday services, but making the point that those people were physically there to witness something they thought was impossible, and still it was such an incredible thing to take in that you couldn’t really blame someone like Thomas for being a bit skeptical. There are also some reassurances to Mary that “the sun will rise again”, acknowledging that the extraordinarily brutal death Jesus went through must have hit his own mother the hardest out of anyone, and thus her joy upon seeing him again was probably the most palpable. Peterson notes in his blog, where he’s got a little “Behind the Song” vignette for every track on this album, that this is one of the tracks he’s most proud of, and that he can’t really take credit for it because his multi-instrumentalist buddy and frequent collaborator Ben Shive wrote it. I definitely notice that the lyrics here are a bit denser than Peterson’s usual, packing in a lot of hard truths about us basically being lying, cheating Pharisees as deserving of death as the thief who hung beside Jesus and said “Lord, remember me when you come into your Kingdom”, which is the main hook of this song. The lyrics are commendable for covering so much ground in five and a half minutes. The composition of this song, though, seems to be at odds with all of the heavy expositional lifting it had to do. It’s as if Shive realized he’d need some sort of an simple hook to make this all go down easier – not a bad thing in and of itself, except that the melody he came up with isn’t a terribly memorable one, so the song just sort of floats about between its lukewarm chorus (which is backed by a rather ill-fitting drum loop) and the “talkier” verses. The bridge tries to throw in another sing-along bit, “We will always be with the Lord”, which then intertwines with the chorus, and normally this is a structural trick that I enjoy hearing in a song, but it sounds so half-hearted here, as if the backing vocalists who try to pick it up and run with it aren’t really convinced they can really do much with it. It’s a song that feels like it should be a home run, but that instead comes off as more than a bit awkward. The first moment where I noticed a similarity between songs on the two volumes of Resurrection Letters was here, where the looping piano melody with its slightly lopsided rhythm reminds me quite a bit of “Invisible God”, which was track four on Volume 2 (and my personal favorite track on that album). Where that song put emphasis on beats and notes where it wasn’t expected to make me think at first that it wasn’t in 4/4 even though it turned out to be when I listened more carefully, this track genuinely is in 7/8, at least during the verses, transitioning to a simpler rhythm at times, but not staying there for long. There are probably more time signature changes than I’m fully realizing – I actually find the rhythm of the song a bit difficult to follow, even though I think there’s a lot of understated beauty to its arrangement. I’m glad that Peterson decided to forego the easy sing-along here and do something a bit more adventurous from a composer’s standpoint, even though it probably means a lot of folks will find this track to be skippable due to not being able to remember how the heck the chorus goes. Lyrically, Peterson is once again trying to get himself into the mindset of someone who has physically seen the resurrected Jesus, though this song looks a little further ahead into the story, as the disciples began to go out and spread the word of what they’ve seen, planting the seeds of a grassroots movement that would one day become known as “Christianity”. Their claim of having seen the human embodiment of their God die and rise again from the dead with their own eyes sounds absolutely ludicrous to most others who hear them tell the tale, and of course they’ll face a lot of skepticism and even persecution for it, but they know too much to recant their beliefs at this point. A belief in something you’ve actually experienced for yourself isn’t really a belief any more, it’s just a fact… unless of course someone can convince you you’re crazy and didn’t really see it. And I like how Peterson acknowledges that the “maybe I’m crazy” possibility probably crossed some of these guys’ minds, given the opposition that they faced, but ultimately they stood firm. For me, this one’s a thought-provoking highlight, though due to the twists and turns slightly working against the “hummability” of the song, I probably wouldn’t say it’s an all-time favorite. It doesn’t bode terribly well for a song about remembering stuff when I can’t really remember how it goes once the album is over. I feel like there are a few of those that always slip through the cracks due to Peterson’s generally low-key nature, but I’m surprised that I kept forgetting about this one, since its chorus changes its atmosphere from more of a folksy ballad akin to Peterson’s early stuff into more of a percussive shuffle, similar to “Rocket” from Volume 2. I really liked “Rocket”, and I can only assume that this song is intentionally (albeit only faintly) echoing that one. But something about the melody here just keeps it from taking off. The lyrics are also incredibly didactic, to the point where it may as well be titled, “Hey Kids, This Is Why We Take Communion!” I don’t mean to rag on Peterson for being straightforward when the subject matter of a ritual representing Christ’s body and blood obviously wouldn’t work well if disguised as an obscure metaphor – this song needs to be upfront about what it has to say. I just don’t hear as much creativity in the phrasing compared to the better songs on this project. This track tells more of a personal story about Peterson traveling to Jersualem, observing the worshipers at the temple’s Western Wall, and being overcome himself by the deeply emotional experience. It led him to realize that as the Jewish people greet each other with “Next year new Jerusalem” during the Passover Seder, he too as a Christian longs for the reconciliation of a broken creation to its Creator. While a song about the restoration of Jerusalem has the potential to be a political minefield, I think Peterson sidesteps that issue by viewing it as more of a metaphor, holding out hope that perhaps we’ll be one step closer to a renewed creation in a year’s time than we are now. While I appreciate his ability to find parallels in Jewish and Christian rituals, I have to say that this is the blandest song on the record by a long shot. There’s plenty of instrumentation, but neither the piano nor the guitars nor the vocal melody really stand out as anything memorable, and the backing vocals and “na na na”s thrown in sound like an especially weak attempt at bringing some sing-along value to a wordy song, much like in “Remember Me”. It’s reaching for something that it never comfortably grasps, and the result is that I’m a bit embarrassed for him every time I listen to this one. This is also a Ben Shive song, in this case one Ben actually recorded for an album of his own, that Peterson later asked for permission to cover since he thought it fit the theme of Volume 1 so well. It seems like a pretty straightforward ballad about overcoming adversity – the way it slowly builds and throws interesting twists and turns into the chord progression makes it feel sort of like it could be a number from some sort of a play or musical (which is definitely territory that Peterson knows well). The lyrics are vivid in their promise of God returning to restore justice to the world: “If a thief had come to plunder/When the children were alone/If he ravaged every daughter/And murdered every son/Would not the father see this?/Would not his anger burn?/Would he not repay the tyrant/In the day of his return?” I actually think the lyrics make it a better fit for the second volume, personally, but since Shive’s version was probably too new for Peterson to get a cover done in time for Volume 2 back in 2008, we get it here instead, ten years later. This call-and-response anthem was the first song released from the project a good month or so ahead of the album release, probably because Peterson wrote it with the liturgical services from his own church in mind, and figured it would lend itself well to being used in Easter services if music directors could get their hands on it with enough time to prepare! I’m probably gonna break with a lot of Peterson’s fanbase when I say this, but despite admiring his intent here, I think the execution is incredibly awkward. The verses of the song all pose questions for the background singers (or obviously the audience in his concerts) to softly sing a response to: “Do you feel the world is broken? (We do. )/ Do you feel the shadows deepen? (We do. )” The idea behind this makes sense – a liturgy gives the congregation a chance not just to listen, but to respond. The problem is that he’s asking rhetorical questions here, making the constant refrains of “We do”, “It Is”, and ultimately “He Is” seem a bit redundant, which isn’t helped by the lack of anything melodically interesting happening in those responses. The lead-up to the chorus is where it gets weird, because Peterson turns to rhetorical questions where anyone paying attention would be expected to respond in the negative: “Is anyone worthy? Is anyone whole?” There’s no audience response part here, but I have to feel sorry for the one clueless person who tries to sing back “We are!” out of sheer pattern recognition. Ultimately this is leading to the theologically sound notion that only Jesus is worthy, which is affirmed as the song reaches its climax. I don’t have any issues with what the song has to say. I just don’t find the piano ballad arrangement or the meek backing vocals to be all that powerful – and this is the song that is clearly meant to be the climactic centerpiece of the album. It’ll probably end up on any best-of compilations Peterson puts out from now until time immemorial, but for me, it’s actually one of the least interesting songs on the entire Resurrection Letters project. Sorry, I know that probably stings a bit, but I have to be honest here. The project concludes more or less as I would have expected, with a song tying the conclusion of Volume 1 back into “All Things New”, which was the introductory track on Volume 2. Aside from the title, the similarity isn’t clear right away, but then that signature acoustic riff comes in midway through, and there are other little sound effects and bits of melody that are clearly quoting the song that this one is meant to serve as a bookend to. The latter half of Volume 1 has largely been concerned with not only humankind being reconciled to God, but also Creation itself. Sometimes we view the Gospel with such an individualized, “Jesus is my best friend”-type focus that we can lose the larger picture of God working through us to restore creation, and I think that’s what Peterson is trying to address here when he describes God as the connecting tissue of the entire universe, something vastly bigger than any single one of us can truly fathom. This song isn’t a big finish to the project, nor do I expect it to be – it’s meant to be a puzzle piece that needs its counterpart to complete the picture, and so it closes out Volume 1 with the sense that we’re expected to go back to Volume 2 and revisit the rest of the story now that the first part has been more fully fleshed out for us. Even though I had predicted just from seeing the title that Peterson would end the project this way, it still put a smile on my face to hear how he followed through on it.